I love the first day of school here at Sunnyside Christian. The kids come through the door wide-eyed with their new backpacks, squeaky clean shoes, and butterflies in their tummies. Parents are taking pictures, friendships are reunited, and classrooms are brightly welcoming. Because we want everyone’s year at SCS to be the best it can be, I’m going to be listing a few tips for our parents and students. But before that, I want you all to know that our administrative team, Del Dykstra (at the grade school), Dean Wagenaar (at the high school) and I are always willing to take your phone calls, meet with you, and answer your emails if you need anything. And so here’s the list! Pray daily for the success of your children, their teachers, and our school. You’re already investing your dollars in their education, and we ask that you invest your prayers in their education also. Communicate with your child’s teacher. Our teachers are helping you educate your child. That’s right: we’re helping you. So if you have concerns about grades, assignments or attitudes, check with the teacher first. And if things are going great and you’re really excited about the progress of your child, communicate that too! Read your newsletter. The newsletter comes out every Thursday in the backpack of your youngest student. It is also emailed to you. This newsletter is packed with valuable information on upcoming events, volunteer opportunities, and important details. Check our website regularly. There is a calendar on the home page that shows events ranging from sports, college testing, chapel, etc. The Knight Spirit Store is located on the website also, where you can order clothes with SCS logos. Also, on the rare occasion that we’d get enough snow and ice to delay school, check the website for that information. “Like” our SCS and SCHS Facebook pages. 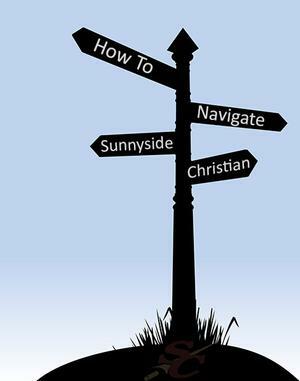 These pages are updated regularly with lots of pictures of life at Sunnyside Christian. This is a great way to see what your children are doing, and it gives you good ideas for supper conversations! You’ll also find event updates, important announcements, and other goodies. Okay, since it’s the first day of school tomorrow, I’ll keep it short. See you tomorrow!